A Pigouvian tax may be used by the government to address the problem of market failure due to an externality such as pollution. In this Leibniz, we show mathematically how to find the Pigouvian tax that achieves Pareto efficiency in our model of banana production using a polluting pesticide. This is illustrated in Figure 12.5 of the text, reproduced as Figure 1 below. 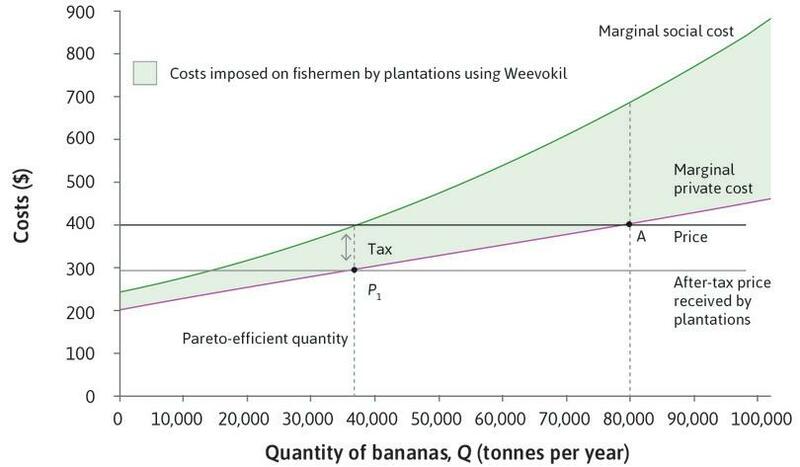 The Pareto-efficient output of bananas is 38,000 tonnes, where the marginal social cost is equal to the price ($400). The tax is equal to the difference between the marginal social cost and the marginal private cost at this level of output, which is $100. The after-tax price, , is $300, and they choose an output of 38,000 tonnes because that is where the marginal private cost is equal to $300. Figure 1 Using a tax to achieve Pareto efficiency. The first term, in square brackets, is the producer surplus, taking into account the tax producers have to pay, and the second is the costs borne by the fishermen. The third term is the tax revenue obtained by the government which, provided that the tax revenue is used to benefit society, also contributes to the social surplus. But the two terms cancel each other out. Thus the social surplus is unaffected by the tax, and the Pareto-efficient output level remains the same, whether or not a tax is imposed.